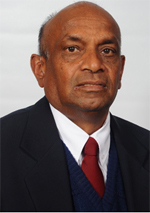 Premanathan "Prema" Naidoo, the youngest son of Ama and Thambi Naidoo, was born in Doornfontein, Johannesburg, Transvaal (now Gauteng) in 1945. He attended the Government School for Indians in Doornfontein until he entered high school. The government then closed the school to force Indian families to move to the segregated area of Lenasia, Transvaal that was established due to the Group Areas Act. He attended the Central Indian School, which was established by the Transvaal Indian Congress (TIC) in Fordsburg, Johannesburg. Its faculty included many leaders and activists in the liberation movement such as Molly Fischer, Duma Nokwe, Alfred Hutchinson and Dennis Brutus. He had to leave school early to look for a job as his brother, Indres Naidoo, was imprisoned on Robben Island for sabotage in 1963. He was first arrested when he was fifteen, while distributing leaflets of the South African Congress of Trade Unions (SACTU), on the charge of trespassing railway property. He was found guilty, cautioned and discharged as he was under the age of sixteen. We were under constant surveillance. We used to be raided regularly, at least once a month. But we were very careful. We never kept banned literature at home. We used to be careful when we talked over the telephone. We weren’t involved in underground work as such. But a guy would come and say: “Listen, I came on a mission. I want transport to take me to the border”. My brother and I would arrange the transport. There were smugglings sometimes from Robben Island to London. Then we would look for somebody who was not political, who was trustworthy and who was going to London to take the message. So throughout the period we would do that kind of work. Prema was employed in a clothing store owned by Issy Heymann, a Communist, but the police closed the store and most employees were arrested. Following this, he worked as a welder in a factory. From the late 1960s, when all political activity seemed to have been suppressed by massive repression and terror, he was active in the Transvaal Indian Youth Congress. He was a founder of the Human Rights Committee with Sheila Weinberg, a former political prisoner whose family had suffered persecution, and Mohamed Timol, whose brother, Ahmed, had been tortured to death in prison. The Committee was established to focus attention on political prisoners and assistance for their families. During the late 1960s and 1970s, Prema Naidoo played an important role in supporting detainees and the families of struggle veterans, and actively pursued political work through the Human Rights Committee. Then in the 1981 and 1982, he was detained for his links to underground networks and was severely tortured. He was the Assistant Secretary of the Transvaal Anti-SAIC Council (TASC) which, in 1981, led a very successful boycott against the South African Indian Council (SAIC) elections, a puppet body set up by the Apartheid regime. Prema was detained on 21 November 1981, under the Internal Security Act, and subjected to beatings and torture. He was brought to court after several months and sentenced on 1 April 1982 to three years` imprisonment (two years suspended) on the charge of harbouring an escaped convict. Stephen Lee, Timothy Jenkins and Alexandre Moumbaris - three white political prisoners - had managed to escape from the Pretoria Maximum Security Prison in 1979. Prema was accused of finding a place for Stephen Lee at the request of their mutual friend, Shirish Nanabhai. Nanabhai and Prema were charged for this. He shouted “Amandla” (Power) and gave the salute of the freedom movement as the sentence was passed. His wife, Kamala, told the press she was proud of her husband. Shortly after his release in 1983, he was elected to the executive of the revived TIC and he played a key role in a number of formations linked to the United Democratic Front (UDF). Naidoo was detained again after he attended the funeral of Matthew Goniwe and others, known as the Cradock 4, in Cradock, Eastern Cape (now Eastern Province) during the first state of emergency. Prema was detained again when a second State of Emergency was declared in 1985. He remained in detention for almost the entire duration of the first emergency, about eight months. During the second state of emergency, from 1985 to 1989, Naidoo was in hiding for a long period. He has been a Councillor of Johannesburg since the democratic elections of 1994. He has served as the mayor of the South-Western Substructure of Greater Johannesburg (1994-1995) and as the chairperson of the executive committee of the Southern Metropolitan Local Council (1995-2000). Thereafter, the former mayor of Johannesburg, Amos Masondo, appointed him as the mayoral committee member for health (2000-2006) and then as the mayoral committee member for environmental management (2006-2009). At present, he is the Chief Whip of Council. Naidoo also serves on the board of the Ahmed Kathrada Foundation. Naidoo lives in Lenasia and is married to Kamala. They have two sons, Kuben and Duggie.